Pet hair is a problem that all owners have to put up with to a degree, but it can become increasingly difficult to see the lighter side of shedding during big molts of seasonal coats and blow outs. Some users may be happy enough to let nature take its course and deal with the mess left behind. Others are in need of a tool to remove the dead hair and make the issue as quick and painless as possible. This is where we find ourselves looking for the best dog brush for shedding. Different types of brushes for shedding dogs. As you will see from the products we have highlighted below, there are some different styles of grooming brush available here. Each option provides a different approach depending on the coat type of the dog. Some may seems a little extreme, and others a little weak. That it why it is important to match the right brush to the right coat type. These tools may seem like the ideal solution for heavy shedding pets, but they are best suited to fluffier, double coated breeds. These rakes strip the dead hair of undercoats. This removes the winter coat in one quick session. The approach is not advisable on single coated, short coated breeds. Dogs with single coats and shorter hair often do better with a softer comb. These tools have a series of short, rounded teeth that separate the hair, attract dead fur and stimulate oils in the coat. It is useless on thick coated dogs, but ideal as a daily tool on those that shed consistently. This tools can look a little too gentle to some owners. Yet, they are perfect for short coated dogs that shed more minimally. These easy-to-use options deal with stray hair in a gentle stroking motion. It is as fun for the dog as it is the owner. **Above all the ratings are given by our Authors / writers based on their experiences / expertise. What should dog owners be looking out for here? The first thing to consider with these products is the fact that there are many different styles of grooming brush out there. Below we have split our product recommendations into two sections. First there are the tough deshedding tools that rake out the hair of the undercoats in large quantities. These products are used occasionally to deal with big molts and problems. It can be a laborious process, but the better the blades and design, the more hair will be collected. Here it is important to look for a device with a strong stainless blade and an ergonomic design for comfort. It may also help if the device has some method of collecting the shed hair to minimize the clean up. The other option here is to look for a more gentle brushing tool that takes the hairs from the top coat. These brushes are to be used daily, but they are more gentle and simplistic for ease of use. There is also the chance that dogs will prefer these unobtrusive rubber tools and brushes. Top 8 dog brush for shedding. 1. 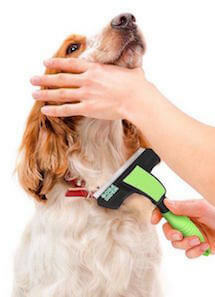 FURminator deshedding tool - number 1 best seller in dog shedding tools. The FURminator is the dog grooming tool that many dog owners immediately turn to because of its reputation for getting to the root of the problem – as it were. There are different models for different hair lengths, but each works to strip out the undercoat during a bad shed. This groomer-designed model is different from any brush or rake and has a lot of happy fans. The main selling point here is the idea that it is able to reduce shedding by as much as 90%. it deals with large amounts of undercoat in a quick, effective manner to reduce the hassle of a big molt and the need to clean up. There is an easy-to-use design and a nice shape. The problem with the FURminator is really a problem with all deshedding tools like this. Some dogs are simply uncomfortable with the method and prefer a more gentle approach. There is also the fact that it works best after bathing on a completely dry coat. This can add to the overall process. 2. 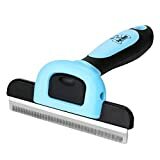 DakPets Pet Shedding Brush - Best budget option. None of the products mentioned here are especially expensive. However, there are sure to be some pet owners that would like to find a cheaper version of the FURminator if they can. This DakPets model has to be the best option here as it promises the same results on shedding as the HappyDogz model and the same quality of blades as the FURminator. The specification for this product highlights a lot of potential benefits in the design. This is designed to find that ideal mid-point between the gentle approach and the tough hair removal that buyers need. It can deal with dander and hair with the strong 4’’ stainless steel comb. Unfortunately, those that make direct comparisons between this model and the Furminator can see the flaws. It is not as well made and comfortable, with many finding that the handle isn’t quite right. It also doesn’t seem to be able to control the mess of the shed hair in the same way. 3. SleekEZ Original Deshedding Grooming Tool. It is interesting to look at this model directly after considering the more “professional” rake above. There is a clear difference in the size of the blades and the shape of the tool. This one almost looks friendlier and easier to use. There is a pleasing look to the device, with that ergonomic poplar wood, and no strange features. All users have to deal with is the blade and the right hand movements. There is no doubt that this model fits comfortably in the user’s hand. This means that there shouldn’t be much concern about fatigue in the hand or wrist. This is essential with long deshedding tasks on large dogs. This ergonomic grip also means that the tool should slip and damage the coat. Others love this model because it is a multi-purpose device. Some dog owners will use in to remove the hair shed onto the furniture and carpets, not just as a grooming tool. This one seems to be more about the design of the brush and the ease of use for the human owner, rather than the impact on the coat. The blade is small and thin and while effective on some coats, may not have the impact of tougher blades. 4. HappyDogz Shedding Brush - Best versatile deshedding tool. It is easy to focus in on the FURminator as the ideal model for a quick effective approach to removing difficult undercoats. However, there are some other brands around that promise just as good a result. This HappyDogz product is appealing because of the claim that it works on dogs and cats with coats of different lengths. There are also the recommendations from groomers and vets. This option claims to go a step further than the FURminator with a reduction in shedding of 95%. The stainless steel blades are also designed to strong enough to deal with difficult coats, but gentle enough that dogs won’t mind them. There is also a nice little e-book on grooming and techniques to help first time users. There are those that say that the product does have the potential to cut longer hair because of the edge on that stainless steel rake. This could be an issue for those that want the most gentle approach possible. There are also those that say that it is not so effective on fluffier coats, like those of the Pomeranian. 5. Pet Neat - Pet Grooming deshedding Brush. This heavy-duty looking “brush” looks like a tool for some serious de-shedding activity. There is an appealing promise here that it is able to reduce shedding by as much as 95%. This will always depend on the breed, the actions of the owner and frequency of the brushing. Still many owners would agree with that statement. This is more of a rake, not a brush. It is important to note the difference here because this is not so good for short coated breeds. It is built to handle those thick undercoats. This is definitely a quick solution. It doesn’t take long to get a pile of fur almost the same size as the dog. This is a great advantage for those working on dogs with seasonal shedding problems. The metal wont attract loose hair in a coat, but it will rake undercoats out in large clumps. The best results will occur on the right breed type. There is a slight problem in referring to this as brush because some people associate brushes with more gentle tools. There are some models that have softer edges and rounded tips. Here there are some owners that say that the metal is a little sharp and uncomfortable on the skin. Be careful when raking coats with this model. 6. The Pet Portal Self Cleaning Slicker Brush for Dogs and Cats. A problem with some of the rakes is the feel of the tough metal on the skin. This slicker brush promises a more gentle approach with these softer stainless steel pins. They also promise that it is still tough enough to handle loose hair and tangles without much trouble. An added bonus here is the addition of the ebook on dog grooming tips to get the most out of the best dog brush for shedding. The main advantage with this model has to be that self-cleaning function. This is sold as an “Easy to Clean” brush for all type of dogs. All users have to do is press a button and all the steel pins in the brush retract into the body of the tool. This frees up all the hair for easy collection. This makes a big difference compared to some of the other tools below. The company say that this model come “highly recommended by pet owners, vets, and professional groomers”. While this is mostly true for owners, some pros may find this device a little too flimsy. There are some issues with the quality of the build and the button on the retraction can degrade with time. 7. 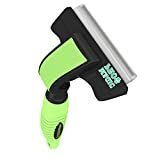 Kong Zoom Groom - Best manual toy for dog grooming. Not all grooming tools have to big tough machines. There are bound to be some nervous dogs that don’t like to be around these types of options. 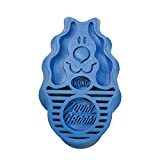 One of the best alternatives for a more gentle approach is this Kong Zoom Groom with its rubber shape and manual approach. There are some great benefits to this product in terms of the amount of hair that it attracts with each stroke, the ease of use and the effect on the coat. The magnetic attraction brings out plenty of dead hair and the bristles stimulate blood flow and oil production for a healthy coat. Also, any owner that uses Kong chew toys knows how strong the company’s products can be. The downsides here are that it can be a little fiddly to clean out after each session and there are some buyers are confused over the different models for different types of coat. There are different strengths for different types of coat and some feel that the cat version is actually the best for use on small dogs. 8. 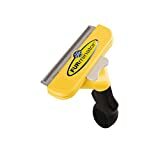 Furminator Curry Comb - the best portable brush for dog grooming. The final product to discuss here in this search for the best dog brush for shedding takes us back full circle to the FURminator brand. 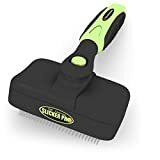 Where some owners may be put off by the strength and nature of the deshedding tool, this comb provides a different approach to frequent grooming with simple molded teeth, an ergonomic shape and portable nature. The design of this comb and use of materials shows that a lot more thought has gone into it than you may expect. The strong teeth work to massage the skin and stimulate oils, much like the shape of the Kong device above. The shape is also design to trap all kinds of debris and has an anti-microbial lining for extra peace of mind. Many buyers will point out that one of the reasons that this model is so portable and easy to use is that it is designed for everyday use. Don’t use it once a week and wonder why there is still shed hair everywhere. Results will also depend on the coat type. Some say it is much better on short-haired dogs. Choosing the best dog shedding brush for you and your pet. It is easy to head straight for the FURminator deshedding tool because of the user-friendly features, clean-up operation and high praise. However, remember that there is no guarantee that your dog will like it. This is why it is important to look at gentle brushes like the Comb and Kong tool that massage the skin and work on the top coat. There are choices in the style of tools and the type of coat they can be used for. Take your time to find the one that suits your breed and your pet’s temperament. How to brush shedding dogs. Once you choose the best dog brush for shedding for your dog’s coat type, you need the best possible technique. Whatever the breed, you need to work with the dogs coat and skin in a thorough but gentle manner. If you are deliberately de-shedding a dog, wash them first. Washing the coat helps to loosen the dead hair and massages the skin. This then allows for healthier hair growth. The coat then needs to be dried out. Dogs with thick, fluffy coats will benefit from a dog blow dryer. This machine use cool air to blow dry the coat and dislodge hair further. Then you can work with the correct tool to brush or rake out the shed coat. Take you time with this process and go through the coat slowly. Be gentle so as not to rip out any hair and cause distress. It can help to do all of this outside, especially with larger dogs. This means that the dead fur can blow away in the yard, rather than go all over furniture.